Awards AAA 5 Diamond Mobil 5 Star The Four Seasons Atlanta is a landmark neo classical tower in Atlantas midtown neighbourhood within walking distance of business shopping parks and the best in the arts. Guestrooms are on the first 19 floors of the 50 storey hotel. 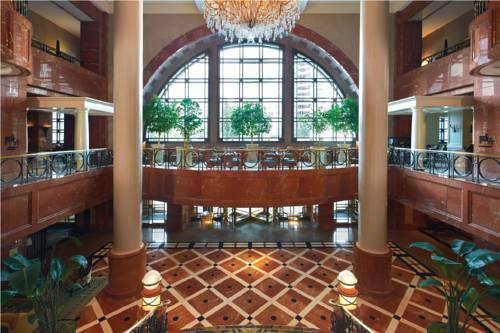 The lobby atrium offers a glamorous formal sense of arrival but the atmosphere is relaxed and contemporary. Each room offers a fresh elegant decor. Rooms have up to the minute technology. BAR MARGO: Bar Margot is a funky communnity lounge offering thoughfull food and smal bathch spirit. Bar Margot menu includes homemade pasta and cheeses craft expressos and high quality coffee selections. Hotel is located in midtown atlanta the cities business and arts district. Only 5 minutes to the city center and 20 minutes from Hartsfield Airport.Centrally located to many major corporations.